Streams of Mercy: Prayers of Confession and Celebration, by Barbara R. Duguid. P&R, 2018. Paperback, 240 pages, $12.00. Reviewed by OP pastor Jesse A. J. Pirschel. 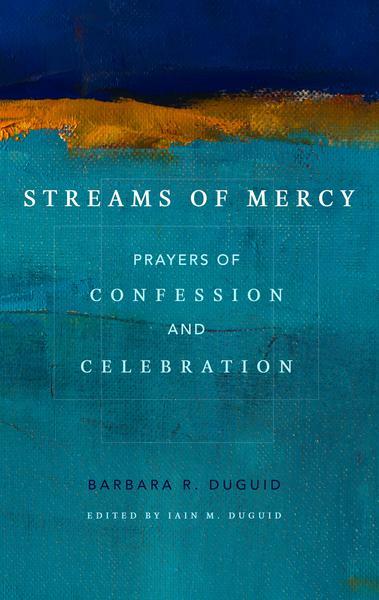 Continuing in her work of crafting written prayers, Barbara Duguid has published a second volume entitled Streams of Mercy: Prayers of Confession and Celebration. Modeling her work after Arthur Bennett’s Valley of Vision, Duguid seeks to supply prayers of confession of sin as an aid to both public and private worship. The book’s pattern moves from a scriptural call to confession, to a confession of sin, to an assurance of pardon, and ends with suggested hymns that match the theme of the prayer. The prayers themselves are expressly Trinitarian, focusing readers’ attention on their offenses against God, their hope in Jesus’s work on their behalf, and their need for the Spirit to work in them to produce what God requires. Duguid’s ability to apply the ideals of the law to actions, exposing both shortcomings as well as false virtues, is a great strength of this book. She shows the sinfulness of sin—not just its wrongness but its ugliness. Christ is presented both as a sacrifice for sin and as the beautiful Savior who supplies what is lacking in our obedience. Finally, Duguid ends her prayers with a plea for the Spirit to give the sinner what he lacks, and readers are left knowing that their hope for renewed obedience rests wholly on God. This volume is helpful in several ways. Duguid’s skilled application of both law and gospel guides readers in their own application of the same. The encyclopedia of sins addressed, coupled with the uncovering of false righteousness, will serve as wonderful tools for those assessing their true state before a holy God. While a book of confession may seem depressing, the presentation of a God who is for us in Christ is joy-inducing. Streams of Mercy would serve well for private and family devotions. It would also serve ministers as they seek to plan services by particular themes since many scriptural texts and hymns are provided with each thematically arranged prayer. That said, the prayers’ usefulness in public worship would seem to be dependent on whether the minister is praying on behalf of the congregation or whether the congregation is praying them aloud. The prayers themselves are quite lengthy and the phrasing is more verbose than terse, which makes public recital more difficult. Along with this caveat, I found the assurances of pardon provided at the conclusion of the prayers too ambiguous at times to be wholly useful without further application by the minister. While always related to the theme, they often lacked the pointedness that would lend itself toward a sinner feeling assured of pardon. These minor critiques in no way negate the strength of the work and its usefulness to the church.